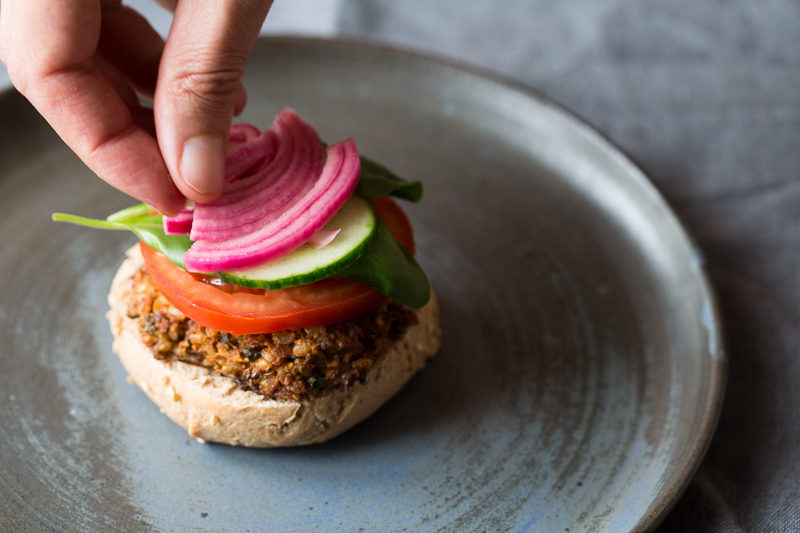 I’m back today with my go-to veggie burger recipe and some bonus recipes including homemade quick onion pickles and wholegrain spelt burger buns. I use my go-to bagel recipe minus the hole in the middle which speeds up the process. 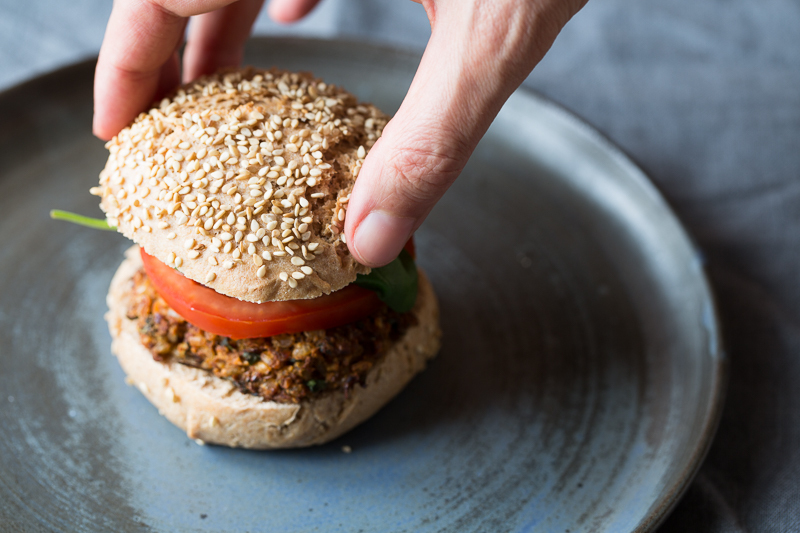 If you are familiar with batch cooking or you tend to have leftover grains and lentils, these burgers come together pretty quickly. Otherwise the whole process takes about an hour and a half. I know, not the simplest recipe but sometimes there is nothing better than a homemade burger. You can add any toppings of choice. I like to keep things simple and I usually serve it with a portion of sweet potato fries which are not pictured here. 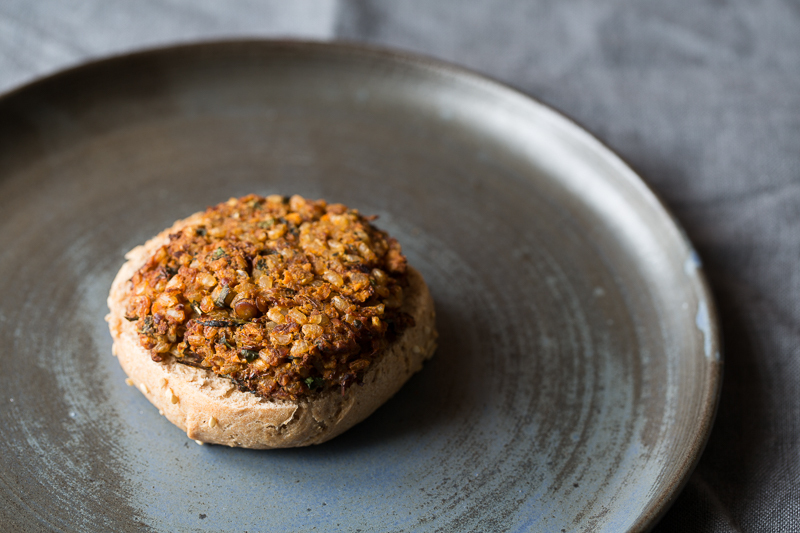 What makes these burgers also pretty easy-going is that they are oven baked, so no messy frying and it takes half an hour for them to get nice and crispy. 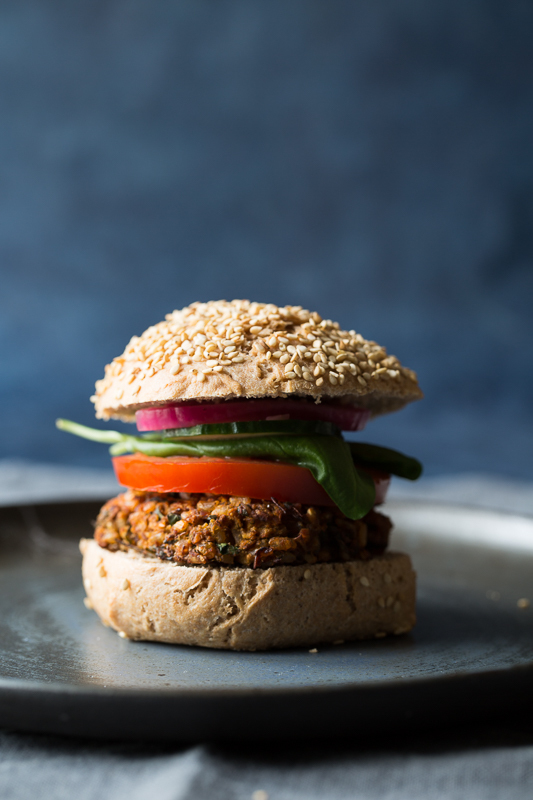 If you are into barbecuing, these burgers hold pretty well, unlike many other veggie burgers. For barbecuing I like to add a flaxseed egg or some pureed sweet potatoes or white beans so that they glue more together but I hope you try it this way first. For more flavour I like to add some caramelized onions and garlic and then some spices from Sonnentor. They have a new range of spice mixes especially developed for barbecuing that are so delicious and that you can use them in a myriad of situations. I love to add them to salads, pastas and pilafs. For the burgers I used Steak that and Smokey Paprika. Both have so much flavour that you can keep the rest of your ingredients pretty simple. I have long been a fan Sonnentor. Their products are mostly developed and produced in Austria (with the exception of products that don’t naturally grow here). The quality of the products is outstanding and their shops have the best atmosphere. I always feel like staying forever and browsing. Heat a pan and add one tablespoon of olive oil and add the onions and sautee for about 5 minutes or until nicely browned. Add the garlic and cook for another minute or so. Add the rice, lentils to a food processor and mix for a few seconds. Add the walnuts, oats and the other ingredients and process until the mixture holds together. 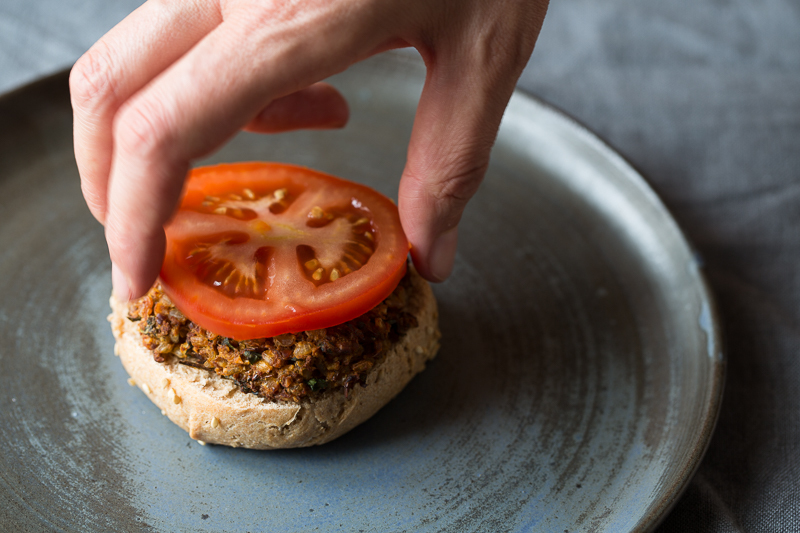 Line a baking sheet with parchment paper and form burgers with your hands. I like to wet my hands with water to help form the burgers. 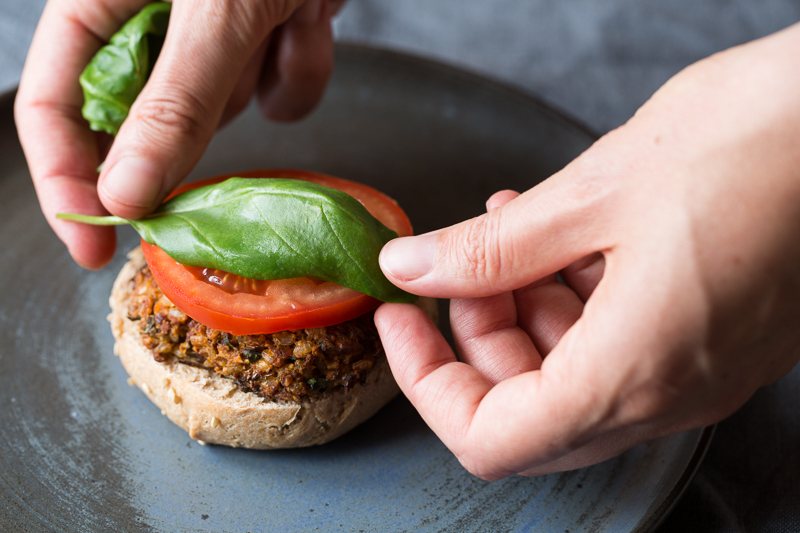 Brush the burgers with olive oil and bake in a preheated oven (180 °C) for 20-30 minutes or until the burgers form a crust. For the burger buns, heat the water to 37 °C and then add the maple syrup, yeast and oil/butter in a large bowl and let it sit for 2 minutes. Add the flour, salt and knead the dough until everything is well-combined and smooth. Le the dough rise for about 30 minutes. Bring about 1 l water to boil in a large pot. Once the dough has risen, form about 10 buns by dividing the dough in half and then so on until you have 10 buns. Preheat the oven to 200 °C and line a baking sheet with parchment paper. 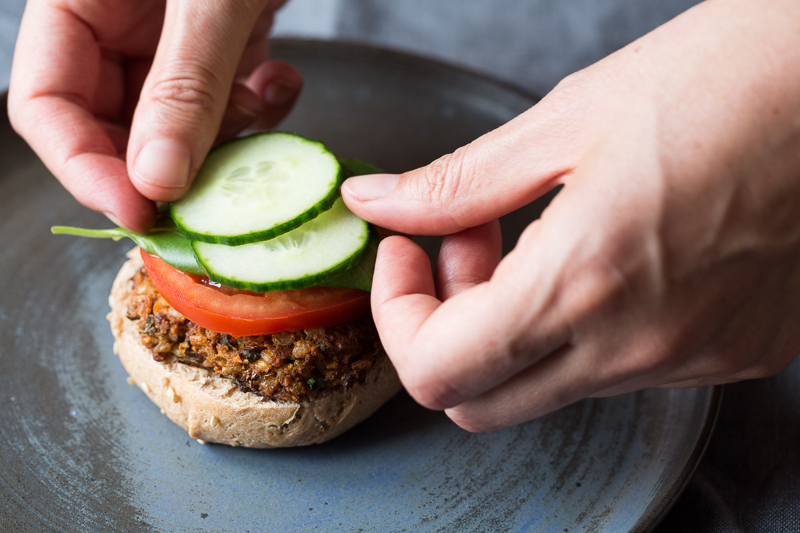 Once the water has boiled, reduce the heat an add the buns individually into the hot water and immediately remove them from the pot with a slotted spoon and place them on the prepared baking sheet. Sprinkle the tops of the buns with sesame seeds and bake for 20 minutes. Serve everything at once with all the toppings in individual bowls so that everyone can choose what they put on their burger.